Hello, and welcome. We are glad that you are part of the RapidMiner Community. If you're here because you are having problems, we're sorry. We want you to know though that we at RapidMiner, and our amazing RapidMiner community of users, work hard to resolve issues large and small, basic to advanced. If you're here for advice, to share knowledge, or just browse for ideas, take your time and look around. With community members all around the globe, there is always a RapidMiner user, somewhere, building models and making predictions at lightning speed. RapidMiner offers two types of support — Community and Enterprise. Community support Community support is a free, self-service option for users with no guaranteed service level agreement (SLA) in place. Through the community portal you have unlimited access to articles, questions and answers, and discussions contributed by RapidMiner technical support personnel as well as the RapidMiner community of users and partners. Enterprise support Enterprise support includes all the benefits of Community support with the addition of purchased service level agreement (SLAs) for personalized, guaranteed response times. For organizations using RapidMiner software in mission-critical scenarios, we recommend this comprehensive offering. 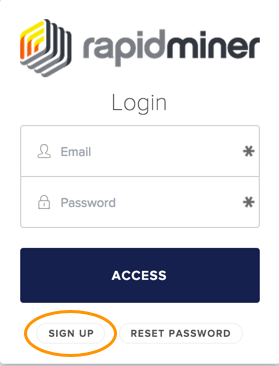 If you do have a rapidminer.com account, enter your registered email address and password, and click ACCESS. Community support is available 24x7, requiring nothing more than an Internet connection. Enterprise support customers — those who have purchased guaranteed response times — can open a support case any time. Response times vary, however, based on the severity level of the issue. With Support teams located around the globe, the Enterprise support desk is available across time zones. The RapidMiner Support & Customer Maintenance Policy describes the details of this for-purchase Support option.